Rob and I went into work for the morning. Afterward it was so gorgeous out, sunny and light winds (as opposed to the 40-50 mph gusts for the last two days), that we decided to go for a flight. 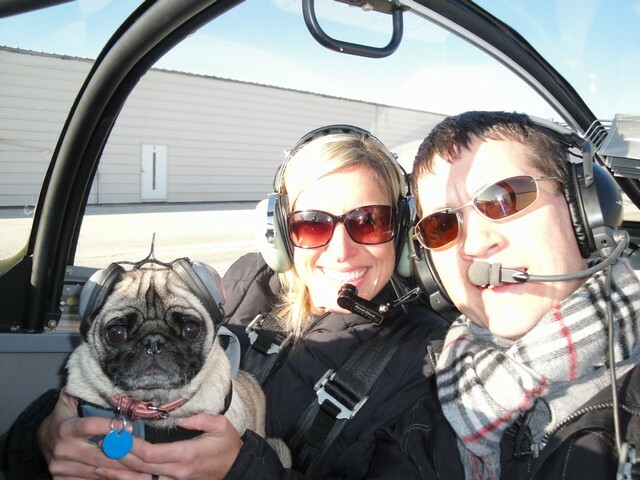 But not just any flight, we took Coco for her very first ride in our plane (or any plane for that matter). She was such a good girl. 🙂 We bought her Mutt Muffs, which is hearing protection for dogs and she wore them the whole flight with no problem. The only part of the flight she didn’t like was the take off. Even though Rob kept the climb less steep, the roar of the engine startled her. I had her in my lap the whole time and loved on her tons. We only went up for a few minutes and then landed. Surprisingly the landing didn’t upset her and she was very chill as we taxied back to our hanger. I think we will keep the flights short and see if she seems to get used to it. If not, no biggie. She is our angel and I’m so glad she did so well. After the flight I ran some errands and then did 11 Miles on the treadmill, sit ups and squats on the BOSU. Now it’s time to get ready to see the limited showing of our favorite band, Dave Matthews Band, featured in a 3D documentary. Categories: Coco, Flying, Marathon, Mercedes Marathon, RV-7, Training | Permalink.